Our objective was to understand the children of the Martindale-Brightwood neighborhood of Indianapolis within their context of community center after school care programs. In order to identify community assets for youth development, and to collaborate with the students to gather data for analysis, we developed methods for creative engagement. The opportunities we were able to uncover led the community centers in continuing their efforts to build a network of assets to better meet the students needs. 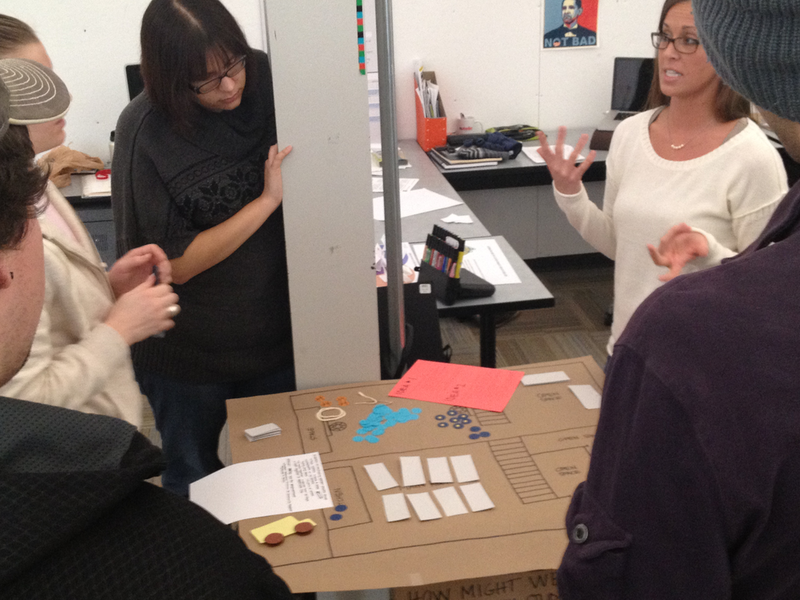 Following the study above, we had a four week prototyping workshop for our Service Experience Design course. I led three sessions of generative and collaborative prototyping to work toward a solution to empower kids in underserved communities. Below is a book I created to illustrate this workshop. After the previous two studies with the Martindale Brightwood Community, I dug deeper and narrowed into one area for opportunity we previously identified. How might we facilitate healthy eating and lifestyle habits? With the intention of co-creating a strategic approach to and implementable solution, I studied the current eating experience at the Brightwood Community Center after school care program, as well as the staff perspective on the process of planning, preparing and serving food to the youth. Together, we mapped out each step and found the areas for opportunity within the eating experience. For each of these spots along the process we had sessions for ideation toward solution. Although endless and relevant, the solutions developed required resources that were unavailable to the after school care program. Without the proper resources and collaboration with neighborhood assets, it would prove difficult to pinpoint the most appropriate solution, and implementation and continuation would not be sustainable due to lack of budget. To directly address the lack of resources, my objective became to create a tool for community leaders to use as a platform for discussion and collaboration toward relationships that could design and implement solution to creating healthy eating experiences for the students.